We at Hawken Energy love to hear such positive feedback and we wanted to share this particular story with all of you. A year ago on January 15th my father-in-law, "Pop", left this earth. He was 83 years old and always kept a wood stove burning in the winter months. We always laughed and said he'd die with a chain saw in his hand. He didn't quite do that, but he was a die hard. He never gave up. Since then, we have made the decision to move in with my mother-in-law. 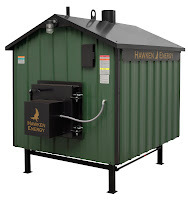 In making changes for my wife and I to move over there, we started looking into wood furnaces. We found your website and were immediately impressed. I liked the way you identified all of your positive attributes without putting down your competitors. You were also prompt to send materials and give us a local contact, Brian Burgess from Lineville, VA. He allowed us to come to his home and see his Hawken wood furnace. He also spoke highly of your company and the time afforded to him when he was making the decision to buy a furnace. Brian came right away to talk to us about the furnace and was so patient, as I called many times. He did a super job with the installation of the furnace and covering up the line in wet, red clay. I guess you might say, "He was the deciding factor in our choice of furnaces." Since getting the stove up and running, he has called often to make sure we were happy. I am so excited about the way it heats and I constantly think about how proud Pop would have been. It lessens the work load so very much. I only wish we could have done this when Pop was alive so he could have enjoyed it. Thank you, Brian Burgess. We made a new friend and a great decision in our choice of furnaces.